Keeping your business healthy and clean is not only a good idea, but it's actually what the law (and common sense) requires you to do. Why is it a good idea? Because you probably wouldn't want the dust or poor air within your business to scare off your clients or employees, right? So, when it is time to clean up the air duct system it is time to call Duct & Attic Cleaning Experts. Our professionals will clean the entire ductwork and restore the air quality to an acceptably high level at any business or commercial property anywhere in Houston! When can Your Business Use Air Duct Cleaning Services? When it comes to commercial air duct cleaning, it is best to have it done at least once a year, and if we're talking about businesses in the foodservice industry – at least twice a year. In addition, when you feel that the air duct system is not working properly, it may be due to dust and filth accumulation within it which partially, or completely blocks it. If the air feels stale or not fresh enough, it may be an indication that the air duct system isn't clean. When calling for air duct cleaning at your business, the first thing that the technicians will do is an inspection of the ductwork's condition. Then it will be easier for them to understand what and where they should clean. They will remove the filters and gain access to the innermost parts of the system so they can clean it up properly. Once it's completely cleaned, new filters will be placed. 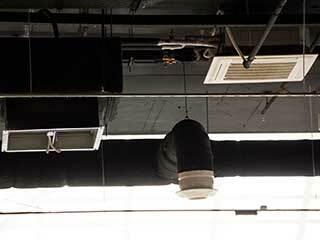 Leaving the air duct system filled with dust and other filth might cause damage your business. It can significantly lower the quality of the indoor air which can develop into bacteria or fungus like mold or others, it can damage the foods and raw materials of your business (foodservice industry related) and it can even get to a point where health inspectors could shut down your business's operation due to contaminated air and poor hygiene conditions, especially if you own a restaurant. Therefore, upon detecting even the slightest of signs that your air duct system isn't working properly or is unable to ventilate the business, call for our services at Duct & Attic Cleaning Experts and we will happily be at your service!